Obviously, the fact that Hollywood decided to make a new Mad Max film 30 years after the last movie came out isn’t that exceptional. If there’s a franchise that anyone has nostalgia for — or at least awareness of — there’s a decent chance that Hollywood will make another in hopes of cashing in. 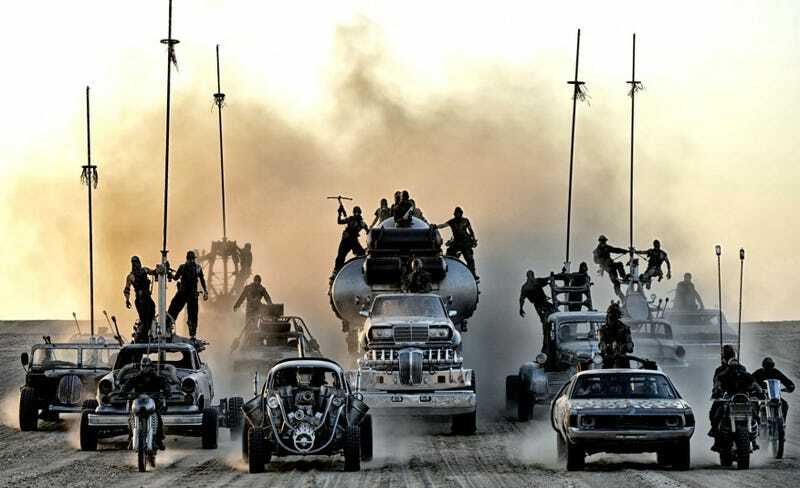 Generally, these tend to be remakes or reboots, so the first miracle is that Fury Road isn’t a needless reboot, but a new chapter in the Mad Max saga. I can’t imagine how much Hollywood execs wanted to remake The Road Warrior, or give a new origin story for Tom Hardy’s turn as Max. I don’t know how director George Miller managed to convince the studio that modern audiences didn’t need to be coddled. Actually, I don’t know how Miller was hired to direct the movie at all. Yes, Miller was the creator, writer and director of all three Mad Max movies, but when has Hollywood ever shown a creator loyalty? That’s not a studio executive’s job. Their job is to make as much money as possible, and given Miller’s track record, there’s no way he should have been hired, creator or not. Do you know what Miller was doing before he returned to Mad Max? In the last 20 years, he has only directed three other movies: Happy Feet, a CG cartoon about a bunch of dancing penguins, Happy Feet Two, and Babe: Pig in the City. Three movies not just for kids, but for little kids. Movies that contain no action to speak of, no violence, and nothing in common with Fury Road. He literally hadn’t made an action flick since Mad Max: Beyond Thunderdome in 1985, and it wasn’t even a very good movie! Yes, Miller was tapped to direct a Justice League movie several years ago, but that fell apart, and no one gets to put “almost” on their resume. Look, I know it makes sense to normal people that you would only let the creator of Mad Max make a new Mad Max movie, but Hollywood studio executives are not normal people. They’re cocaine-addled lunatics who are terrified at the idea of losing potential box office revenue. From that viewpoint, hiring Miller is a legitimately risky decision. He’s woefully out of practice, his last action film was mediocre anyways, he’s 70 years old… there’s no reason to suspect he could make a summer blockbuster, let alone a modern summer blockbuster, let along a goddamned action movie masterpiece. There are plenty of other movie directors out there who, while they may make crappy movies, still make movies that almost always make money. As nightmarish as it is to consider, from a studio exec’s point of view, it would have been more fiscally responsible to give Fury Road over to a Brett Ratner or a Len Wiseman or one of their ilk. But not only was Miller hired, he was given a massive $150 million budget and, more insanely, he seemingly also had complete creative control. You know who gets that deal? Practically no one. Maybe guys like Chris Nolan, who have churned out enough summer blockbusters over the years that the studio doesn’t feel the need to second-guess their every decision. • Have Max be the sidekick in his own film. • Hire Nicholas Hoult, one of Hollywood’s youngest, most attractive stars, then shave his head, paint him bone white, and have him play a character with disgusting chapped lips for the entire movie. • Get rid of Max’s iconic car in the first few minutes of the flick. • Ignore conventional action movie structure in order to present one giant, two-hour long car chase. These are all reasons the film is awesome, but they’re also not things the studio should have allowed. These aren’t safe decisions. But then again, there’s nothing safe about Fury Road. Was Miller blackmailing the president of Warner Bros. or something? Did he find a genie? Because those are the only two reasonable solutions for why Fury Road got made now, which, by the way, is yet another miracle. Reportedly, Miller has been working on Fury Road since 1998 and very nearly got it made on several occasions. At first Mel Gibson was going to reprise the role of Max, which would have been a disaster, because Gibson is an anti-Semitic loon. Then it was going to be a a 3D CG animated movie, which probably would have been lame and looked terrible, and even if it was good wouldn’t have been nearly as good as the movie we eventually got. Ignoring the fact that most films that languish that long in development hell never, ever, ever get made anyways, so many random things had to happen to prevent us from getting an earlier, crappier version of Fury Road. The movie had to be thwarted, over and over again, for nearly 20 years so we could get this version of Fury Road — so Miller would have this specific idea, so the studio would give him that much money, that for god knows what reason the executives didn’t interfere with Miller’s vision, and that Gibson wasn’t involved. So I’ll say it again — Mad Max: Fury Road shouldn’t exist. It shouldn’t have been possible. It certainly wasn’t plausible. Hollywood executives are paid to prevent this sort of potential disaster from ever happening. And yet somehow, one 70-year-old man who had been stuck directing children’s movies for two decades took a somewhat beloved franchise from the ‘80s and not only made one of the most badass movies of all time, but also created a legitimate masterpiece of the action genre.